Here’s what’s up in the world of TV for Tuesday, May 27. All times are Eastern. 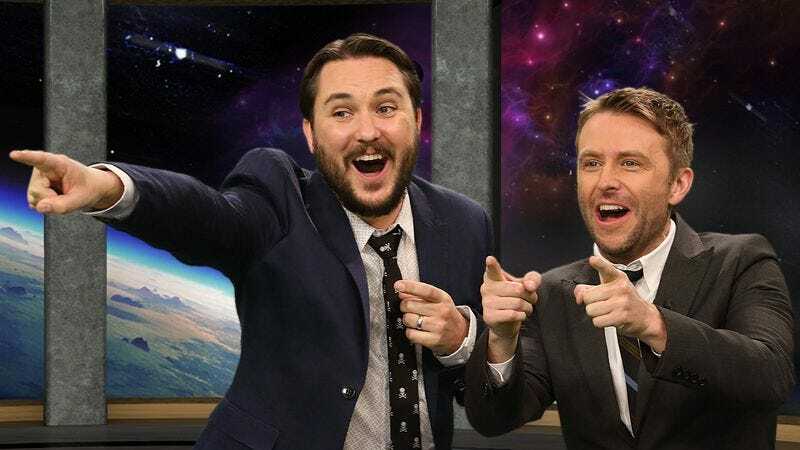 The Wil Wheaton Project (Syfy, 10 p.m.): Wil Wheaton could personally reverse global climate change, invent a cheap source of green energy, and fund the sixth season of Community (as well as the movie), but a handful of bitter Star Trek fans would still hate him for playing Wesley goddamn Crusher on Star Trek: The Next Generation. As if to atone for this egregious crime, Wheaton has spent most of his post-Wesley career working to win back the sci-fi and genre fans he may have alienated by being the naïve teen who saved the adults of the Enterprise “at least seven times.” (When he wasn’t writing a video-game column for some two-bit pop-culture publication, that is.) We’ll have one TV Club writer or another looking at the latest of those efforts—a talk show in the Soup/Talking Dead/Bates Motel: After Hours mode—though they make no guarantee that a stray “Wesley” won’t slip out here or there. Fargo (FX, 10 p.m.): In the interest of not spoiling the unspoiled, there will be no mention of last week’s episode in this space. In further interest of not spoiling the unspoiled, Todd VanDerWerff and Zack Handlen recommend that you keep your eyes away from Todd’s forthcoming interview with Allison Tolman. The Night Shift (NBC, 10 p.m.): They say there’s no place in the medical profession for a guy like TC Callahan. TC Callahan laughs in their face: “Look here, world, I’m going to practice medicine in my own, motorcycle-riding way whether you like it or not.” Todd VanDerWerff has a new hero. Inside Amy Schumer (Comedy Central, 10:30 p.m.): “Amy attends a wedding; a funeral; and an execution,” reads the synopsis. “Sounds like my third marriage,” says the caricature of a Friar being portrayed by Kate Knibbs. The Office (Classic): Following the events of “Traveling Salesmen,” will Dwight return to Dunder Mifflin? He better, because Erik Adams doesn’t have the proper depth of knowledge of the American Revolution to get the titular guest of “Ben Franklin” to admit that he’s not the real Benjamin Franklin. Alien Encounters (Science, 10 p.m.): The third-season premiere promises to introduce the concept of “The Seventh Sense”—which is… umami, we think? Django Unchained (Showtime, 7:15 p.m.): A polite reminder, before a more painful one is required from the film’s protagonist: The “D” is silent. Coming To America (Spike, 8:30 p.m.): For the finest in censored Samuel L. Jackson swears, why not consider a basic-cable version of Coming To America’s hold-up scene, in which Hollywood’s foremost profanity artist is reduced to shouting insults that would sound tame (and reasonably nonsensical) on a kindergarten playground. MLS Soccer: Kansas City vs. New York (ESPN2, 6:45 p.m.): ESPN2 prepares you for the arrival of World Cup Fever. There is no known treatment for World Cup Fever, though avoiding Pitbull for a few weeks might do the trick. Uh, h-Hello? No, no, no Mr. Carlin—Todd VanDerWerff will have his full review of The Bob Newhart Show: The Complete Series next week. Y-yes, Mr. Carlin, What’s On Tonight knows that the DVD set comes out this week. Alright, Mr. Carlin. We’ll get the word out anyway. Yeah. And, no no, that, uh, that rash probably isn’t anything to worry about. But Dr. Bob Hartley’s not that kind of doctor, Mr. Carlin. O-okay. Goodbye, Mr. Carlin. Louie: Only Louis C.K. would make himself work on Memorial Day. Fortunately, his fellow workaholic, Todd VanDerWerff, was there beside him, two peas in an addicted-to-workahol-pod.